Additionally she also had a few cherished material items -a crucifix on a necklace that contained a piece of the true Cross, a relic (tooth) of St Gabriel Possenti, a statue of the Blessed Virgin Mary, some prayer books and holy cards, a rosary which she always kept in her pocket, along with some personal items from her family home. 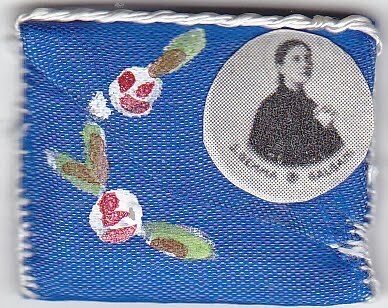 And Gemma used these material items, especially the religious articles, to lead her closer to God. And we read in her Autobiography how she also used these religious objects as a weapon against the devil. 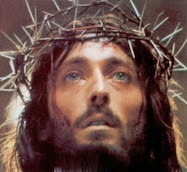 The crucifix that contained a relic of the true Cross which Gemma wore on a necklace was especially powerful against the demons, and she would use this relic crucifix to bless herself, and while looking at the demon she would say "blessed be Jesus!" 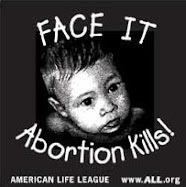 which would cause the demon to shriek, curse and recoil in fear and trembling. 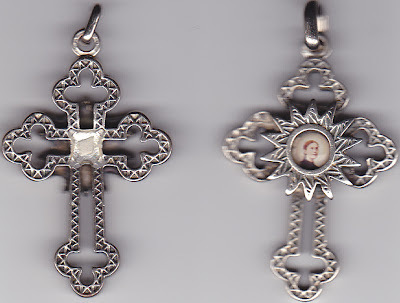 And so material items, especially religious objects, can be a blessing and can lead us closer to God, and so it is with this in mind that this free St Gemma item giveaway is being offered to celebrate St Gemma's feastday on April 11th, and also to commemorate the 4 year anniversary of this website, which has received over one million page visits since its inception, thanks be to God, and for His greater glory. It is a joy when we receive a material gift for free---how we all love to receive something for free! And even more than being free, these religious objects bring a blessing upon us. And so I pray that these items will bring some joy and increased devotion for those who receive them. 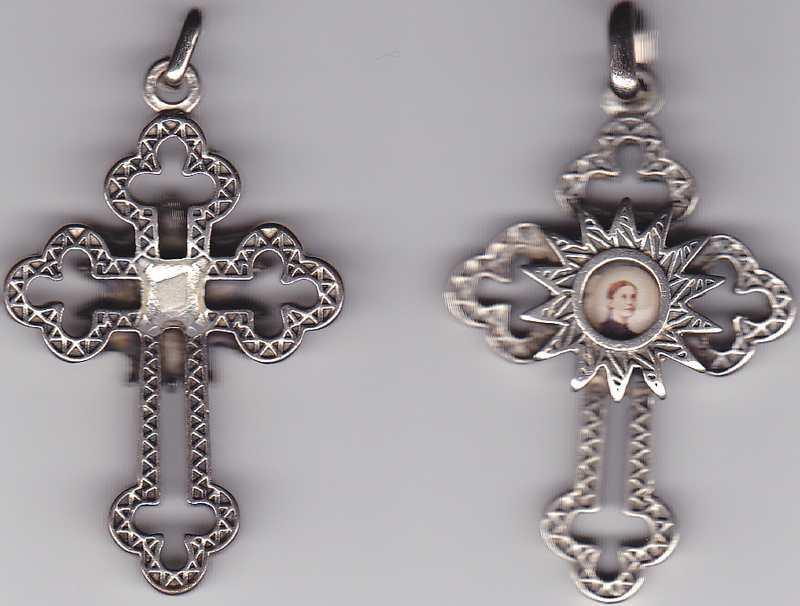 The free St Gemma item giveaway consists of four different items as shown below and is offered to anyone, worldwide. 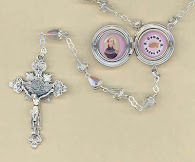 To enter the giveaway, simply send me an email with a message of "free St Gemma item giveaway." -No strings attached. The drawing will be held on St Gemma's feastday, April 11. I will place all the entries in a basket and then I will have my youngest daughter (who is aptly named "Gemma"!) pick out the 4 winners from the basket, and I will then notify the winners by email that day, and all items will be mailed out for free the next day. I will list the names and locations (first names only) of the winners on this page on the day of the drawing. Once again the St Gemma free item giveaway will be held on Gemma's feastday, April 11th. 1st free prize: Rose D.
And speaking of Gemma's upcoming feast day, a couple of weeks ago I went with my wife to visit a specialist due to an ongoing minor medical problem that she has been experiencing for quite some time. It is nothing major, thanks be to God, but she knew that there was a good chance that she would need minor surgery, and of course my wife was understandably reluctant at the prospect of having to undergo that. So while she was in the doctors office undergoing a diagnostic test, I spent part of the time praying to St. Gemma in particular, asking her to take care of my wife concerning this health problem, and to inspire and guide the physician in her diagnosis and treatment. In other words, I was placing the matter into Gemma's hands, and I was asking her to guide and arrange things according to God's holy will. 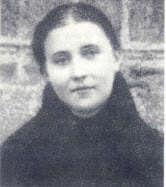 -The pre-operative appointment is scheduled for April 11, St Gemma's feast day; the anniversary of her holy death. - The outpatient surgery is scheduled for May 1, the feast of St. Joseph the worker and is also known as "May-day" -the kickoff for the month of Mary. This day is befitting since we daily entrust ourselves and our family to the holy family of Jesus, Mary and Joseph. 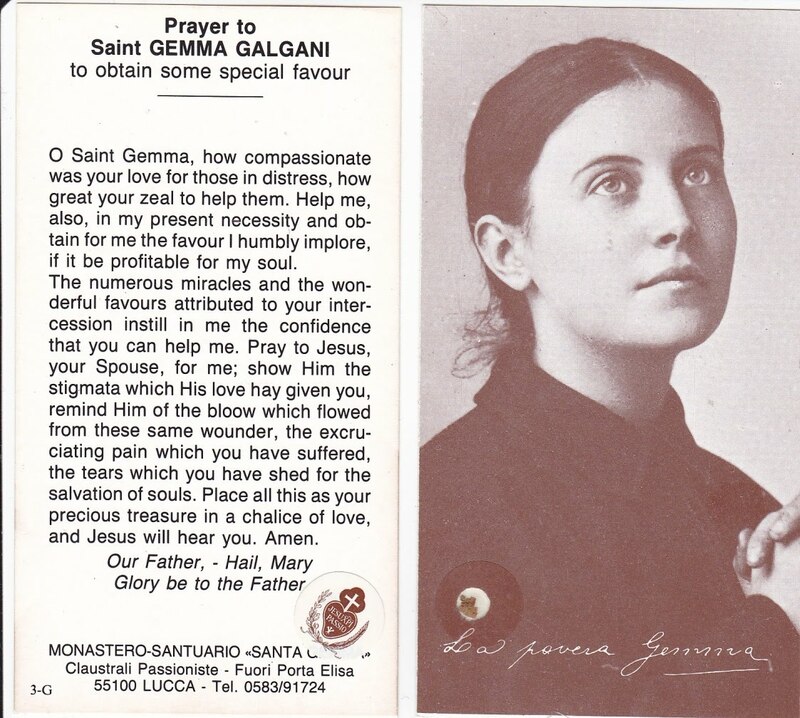 -Finally, the post operative appointment is scheduled for May 16th, once again St Gemma's feast day, this time as celebrated by the Passionist congregation worldwide (for Gemma, of course, is considered a lay Passionist). 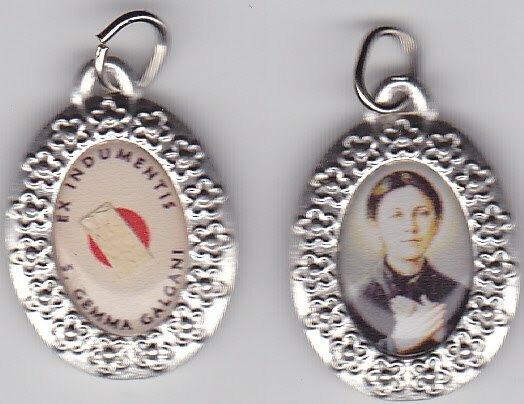 For as those who are devoted to her know, Gemma essentially has 2 feast days, the anniversary of her holy death on April 11, and also May 16 which many years ago was especially chosen by the Church as Gemma's feast day in the Passionist congregation, and is marked by many celebrations in Passionist monasteries and churches throughout the world, as noted elsewhere on this website. 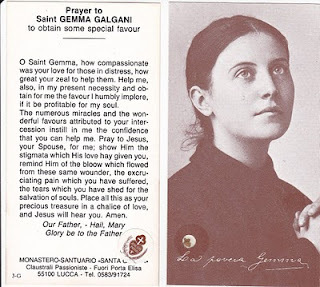 Given my prayers to Gemma at the beginning of this affair it is impossible for me not to see the hand of God and the intercession of St Gemma in the incredible arranging of these dates, to fall precisely on her feast days. In closing, I ask those who read these lines to please say a little prayer that all may go well for my wife with this upcoming surgery. -Thank you in advance! And good luck to all who enter the free item giveway!